Oh, it’s rich and full of irony! 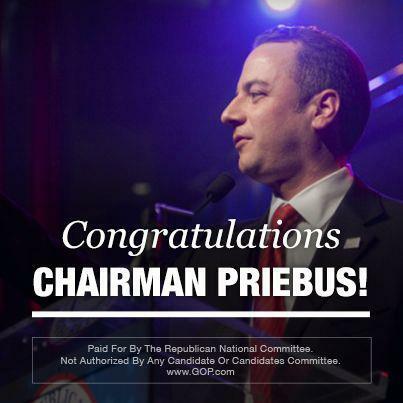 So, the GOP just posted a cute little image on their Facebook page–congratulating themselves for reelecting Reince Priebus as the Chairman of the RNC. You know, the same guy who led the party in approving special rules to protect the establishment–and the Romney campaign–from those pesky grassroots people. Here’s the post as it appears on the GOP Facebook page, “Today Reince Priebus was re-elected as Chairman of the RNC. Help us thank Chairman Priebus for his last two years of service and congratulate him for re-election to his next two!” By all means, go leave some comments! Cool, so these are the same folks who gave us the bailouts, the awesome Iraq war and kept that pesky Ron Paul out of the picture so we could celebrate rinos like McCain and Romney? It’s comforting to know the GOP is headed in the same direction as before! How are those donations coming? *Friends of liberty, try to contain your anger. We need to point out the basic facts of promoting establishment policies and candidates against the will of the grassroots. Even Rush Limbaugh and, in fact, most of the semi-thoughtful conservatives opposed the rule changes that occurred on Preibus’ watch. I believe the GOP needs to hear a clear message that real conservatives and libertarians are going to only donate directly to candidates who are constitutionally minded (and NOT the GOP) until the party gets a clue…I wonder how long that photo will stay posted?